Class size is limited to assure ample individualized attention to each student. rice (50 lbs for $20.49 or 25 lbs for $10.50) and pinto beans (25lbs for $13.14) from Sam's. to purchase rice and beans for OE. a Tarantella, "Winter" from Glazunov's The Seasons and Paquita. her Auburn University Independent Study in Ballet. bags, laundry detergent and leashes. 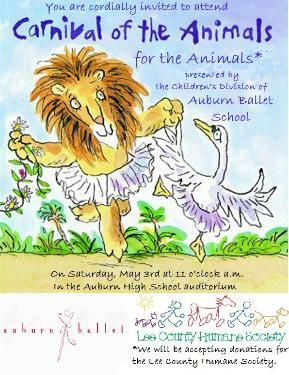 the LCHS in memory of an avid supporter of both the LCHS and Auburn Ballet. donkeys, chickens, fossils (dinosaurs), pianists, lions and more! a group guaranteed to touch your heart.